I'm yet to meet the foolish individual (of any age) who doesn't like Lego. More so than Coca Cola or (thankfully) Apple, there is no one brand in existence which is as universally loved as the Danish inter-locking brick manufacturer. This being the case, a lot was resting on the company's first foray on the big screen with the eponymous The Lego Movie. Mis-judging the tone or content of the film could be catastrophic for the brand and tarnish them in a way their core product never would - early trailer's suggested this could be the case and, instead of anything coherent, the animated film would be made up of throw away pop references stacked one on top of another in a meaningless mountain of nothingness. Another fear, a very real and visceral one, is that Phil Lord and Chris Miller's feature would be nothing but a glorified advert for children's toys a la the Fred Savage/Jenny Lewis starring The Wizard (a forgotten 80s film used to sell games consoles to kids back when that was the industry's target audience). Yet, any concern that Lego would issue a sub-standard product in any medium proved to be foolish. 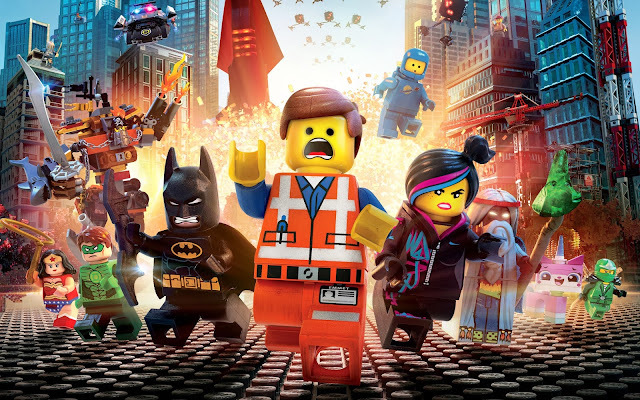 Yes there's a multitude of pop culture references (including Will Arnett as Batman), and to suggest that The Lego Movie has not been made with the ultimate goal of selling toys to children would be naive, but the film-makers understand the very things that makes creating new worlds with Lego such an enjoyable experience and transfers it to a feature-length animation with absolutely zero lost in translation. Like the most artistically successful children's films, The Lego Movie exists in a plane which celebrates the limitless energy of the imaginations of the young. Whilst in The NeverEnding Story, the enemy of our hero was literal nothingness (brought on by the death of imagination), The Lego Movie presents us with a tale in which the biggest threat in existence is a society in which we're brought up with bland uniformity instilled in us - we can only see the world around us as it's "meant to be". We're blindly supposed to buy overpriced coffee, watch dumbed-down television comedies, conform and forget about the security cameras which leer at our every move. This is the life led without any questions by Emmet Brickowski (Chris Pratt), an ordinary construction worker in a universe made of Lego, and one in which he's perfectly content - he spends his days listening to the song "Everything is Awesome", never second guessing if this is indeed the case. Meanwhile, President Business (Will Ferrell) is concocting a devious plan - whilst his underlings are distracted by empty monotony, and the promise of free Tacos, his plan is to use a special item known as the "Kragle" so as to permanently keep the inhabitants of his world forever fixed static in their place. To state he's archly conservative is an understatement. Together with henchman Bad Cop (Liam Neeson) and his fellow cronies, Business must find away to thwart an underground up-rising who know the truth behind the 1984-esque state of society. Whilst the gang contains a gaggle of usual suspects (the aforementioned Batman, a generic Lego astronaut, Superman, etc), it is the inclusion of the newly radicalised Emmet which may prove the key to their success. Like many young men, his conversion to politics initially has less to do with doing the "right thing" and more with a developing crush on the passionate and engaged Wyldstyle (Elizabeth Banks). The majority of The Lego Movie is bright, daft fun - the light satire is a joy as are the brilliantly stupid gags about invisible spacecrafts, the continual subversion of our expectations and, perhaps best of all, Liam Neeson's blast of a fitting, and gleefully stereotypical, song. Yet, the moment that transcends Lord and Miller's feature from good to great is the instant it is revealed who the real story-teller is in this Lego adventure. Like The Wizard of Oz, albeit without the orientation of a scene-setting prologue, the audience is made aware of the fact that what is unraveling before their eyes is not just a fun and fast-paced but meaningless quest but the actualisation of dreams and fears presented in the way that children understand the best - their world makes most sense in the twilight between reality and fantasy. Children, like the freedom fighters in the Lego World, don't like being told what to do all of the time - The Lego Movie reminds us how important the imagination is and how it can be used to change the world around us and how, once in a while, maybe blind obedience isn't the answer (perhaps parents don't know best all of the time). Maybe in the pile of Lego bricks in front of you, there's not just one set way of assembling - if you want to make a man with a cupboard for a heard, or make a pirate out of machine parts, that's up to you. Whilst others might not see the joy in your work, that doesn't matter - it's the power of discovery that's important. Whether it's a child discovering how to construct a Lego car, or something that's never been built before, or whether it's a citizen realising that maybe there's more to life than living the way things are "meant to be", there's joy to be found. Men weren't supposed to fly but the Wright Brother's made it so; cinema wasn't "supposed" to use jump cuts but Georges Melies perfected them and invented special effects; Ruth Wakefield wasn't "supposed" to add chocolate to cookies - the world progresses at the same rate our imaginations grow. A film sure to engage youngsters, The Lego Movie has lots to offer adults too - a cast which includes Nick Offerman, Morgan Freeman and Charlie Day and a soundtrack featuring the awesome combined talents of Tegan & Sara, and The Lonely Island. Watching this film made me think - perhaps Everything IS Awesome after all.